Thanks for your patience during the long delay between posts. I have great news � I passed the Certified Safety Professional (CSP) exam yesterday! I�m working on a celebratory manga, but in the meantime, I�d like to pass along my study tips for this difficult exam. 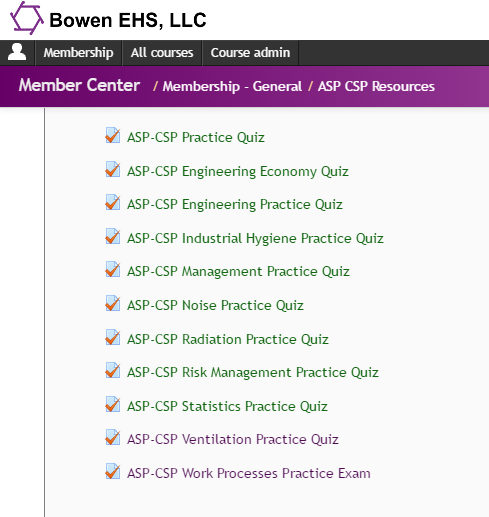 I started studying for the exam in October 2015, when I took the Bowen EHS CSP Online Review Course. This course was immensely helpful in helping me identify where I needed to focus my self-study efforts. Based on the various topics and final exam, I identified my weak spots as: risk analysis, statistics, physics, radiation, and fire protection. A colleague also gifted me with her old (2011) CSP review course materials and a 2010 CSP Self-Assessment. Her course materials also had excellent problem sets and summary material ready for flash cards. I�ve taught Occupational Safety to graduate students for three years, so I thought I had a pretty solid grasp on the material � until I sat down to take the 2010 CSP Self-Assessment from BCSP about 10 days before my exam. Based on my, uh, lackluster score, I decided to redouble my efforts and really study. 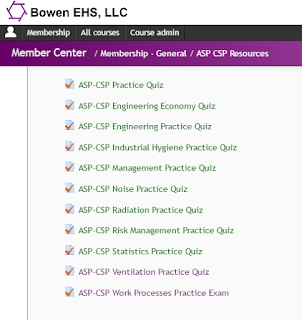 The Bowen EHS CSP Online Review Course comes with an added bonus � a one-year membership to their �premium resources.� These resources include practice quizzes (by topic area) based on a bank of 675+ questions that they have developed since 2003. Each practice quiz contains a reference to the solution page, so you can go back on questions you missed to see how it was supposed to be solved. I went through about 200 questions on the practice quizzes and was able to narrow down my weak areas even further. Basically, my brain hates physics, mechanical engineering, statistics/probability, and risk analysis methodologies (FMEA, FTA, MORT, HAZOP, etc.). Maybe it�s the algebra. I may have arithmophobia specific to algebra. :) My brain just freezes up every time one of those questions flashes on the screen. Some of the super-helpful practice quizzes in the Bowen EHS Member Center. The Industrious Hygienist's CSP Exam safety alchemy art! When I passed the Certified Industrial Hygienist (CIH) exam in 2012, one of the most helpful things I did was create an abstract symbol and fill it with the things I needed to memorize (constants, equations not on the reference sheet, etc.). 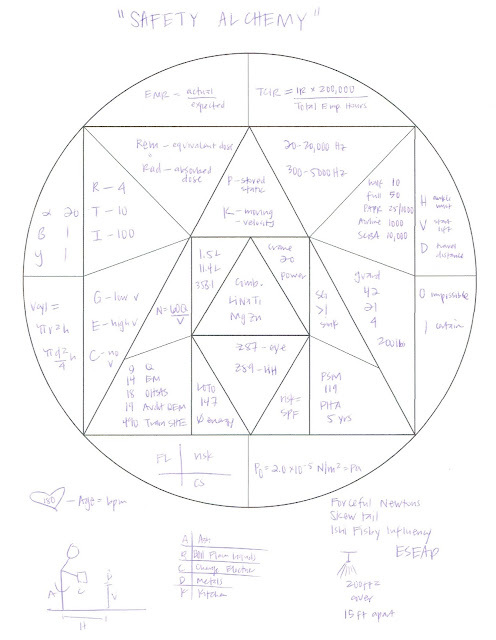 So my CSP exam �safety alchemy� drawing contained the items that I wanted to memorize. The drawing has information about experience modification rates, total case incident rates, radiation exposure measures, the range of normal human hearing, radiation quality factors, sizes of particulates, potential vs. kinetic energy, respirator assigned protection factors, the NIOSH lifting equation, volume of a cylinder, types of hard hats, air changes per hour, eyewash flow rates, combustible metals, distance between a crane and a power line, specific gravity, guardrails, probability, ISO standards, ANSI standards, LOTO, risk management, process safety management, types of fires, and fire sprinkler placement. All in one handy piece of art. 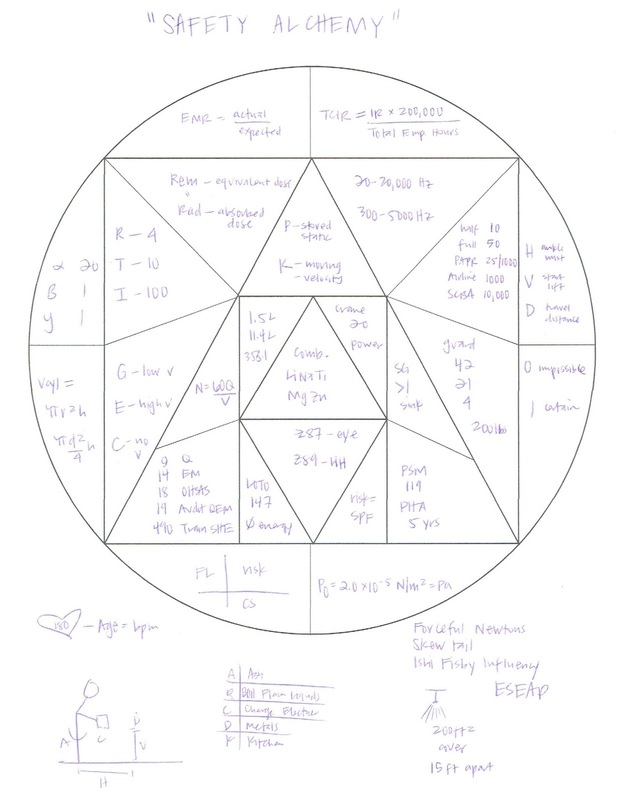 When I sat down to take the test, I used the scratch paper to draw my safety alchemy art, which had a calming and centering effect since I drew it for several days prior to the exam. The most ironic part is that most of the items on my safety alchemy art were not even on the exam version I took. My exam (for double irony) was heavy on statistics/probability, training, risk analysis (FMEA, FTA, MORT, HAZOP, etc. ), radiation, and system safety. I also went through a bunch of OSH Academy courses where I needed a refresher. The OSH Academy website is easy to use and I am currently enrolled in (almost done!) the 132-Hour OSH Professional course. I found the narrative easy to read and the quizzes were helpful. I really liked the custom posters and infographics used in modules throughout the course. there's a healthcare-specific track that I am doing next. Look for more frequent posts and some new manga in future weeks. I am excited to get back to my creative life now that this professional/analytical hurdle has been achieved.